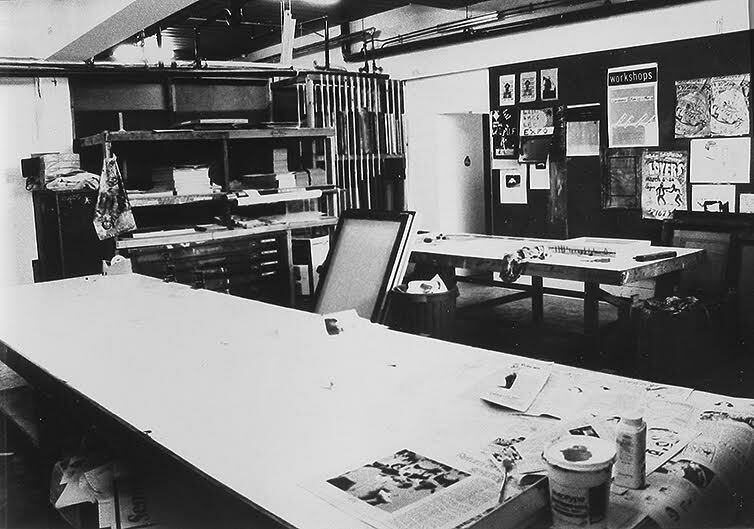 After completing a Bachelor of Design Studies degree at the University of Queensland in 1977 and while pursuing his own art practice in painting, drawing and printmaking he worked at the Queensland University Student Union Cultural Activities department creating a community access screen printing facility, ceramics studio, photographic darkrooms and organised arts workshops and campus entertainment. In the early 1980s he worked as a designer for La Boite Theatre and Popular Theatre Troupe and also undertook design and printing for a fashion label, Kim Hodges Designs, including work on the winning entries in the Australian Gown of the Year in 1982 & 1983. 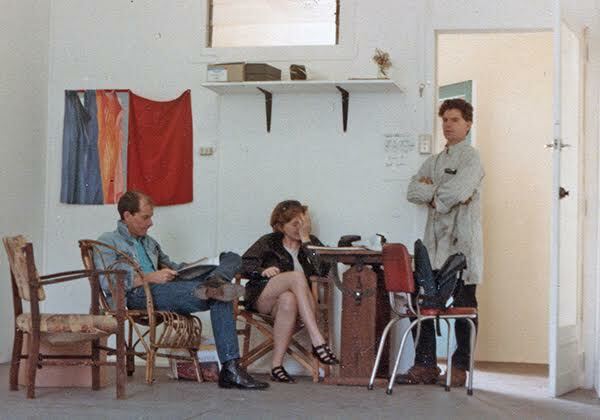 Involvement with a number of artist run spaces – the Red Comb House art studio (1982), One Flat Gallery Office Exhibit (1983) and A Room exhibiting artel (1984). Brian Hi, thanks for your time today, 1980’s Queensland/Brisbane Social History: By way of a detailed personal snapshot, tell me about the milieu you experienced during the late 1970s and the 1980s as a young creative/artist living, working, collaborating in Brisbane, what sort of world was this Queensland society for you? 1 – Growing up in Brisbane and finishing a design degree (architecture) at the University of Queensland in the late 1970s there was no evidence of a visual art scene. There was isolation, a vacuum, nothing to plug into. Visual art and cultural pursuits generally were activities that happened elsewhere but sometimes they came to visit. What is now the Arts precinct on the South Bank was then dry docks and industrial buildings. I remember visiting the old Queensland Museum building in Bowen Hills and inadvertently coming across the Queensland Art Gallery in the basement. I was aware of the Verlie Just Town Gallery, Philip Bacon and Ray Hughes Galleries which were all started between 1972 and 1974. Of those Ray Hughes showed the most ‘contemporary’ work but over all these were not places where you would go to ‘hang out’ and talk to artists about art. They were commercial businesses and a visitor’s role was to look and then buy. There were stories about Ray Hughes throwing people out if they were drinking his wine and not buying art – I don’t know if that actually happened but it did seem possible at the time. 2 – Living, working, collaborating. On a personal level these were one thing not separated. That in itself is possibly an important characteristic of the 1980s art scene. There are a number of themes that come out of that and why it might have been that way in that time and place. For me the living-working-collaborating was greatly assisted by personal relationships formed by living in 14 group houses over the decade. When I moved out of the family home in my last full time year at Uni, 1976, I moved into a shared house with a moving population of other architecture students, their siblings, friends, acquaintances and strangers who would just turn up. In the 1970s it was normal for people to move into a shared house after finishing high school and I think that has changed. Group Houses functioned then something like the internet does now but the relationships that formed were stronger and deeper and I think these became one of the enabling factors for the developing art scene in the 1980s. Apart from the relationships one had with the people you lived with there were relationships with their friends and friends of friends. Information, resources, favours and trust circulated through these extended relationships. For instance the house I first lived in was one of a number bought up for the construction of the Wesley Hospital in Chasely Street near the Auchenflower railway station. The houses that surrounded us all had their own particular characteristics. Across the road was always occupied by political types, to our right everyone seemed to have had some variety of psychiatric involvement – either as patient, nurse or both – and to our left was a house of bikies from Toowoomba. I stayed friends with many of these people who opened up different aspects of Brisbane life. Charlie Scandrett was an anarchist libertarian living in the political house. I bought a platen press with Charlie and he taught me about offset printing and introduced me to the underground press scene in Brisbane. Later on Charlie made it possible to put out Eyeline magazine because his printing quotes were always a thousand or so dollars cheaper than anyone else. Another factor that I would personally identify as influencing the living-working-collaborating landscape was economic disruption and high unemployment from the first recession in Australia in the postwar period. The post-war economic boom ended in the ‘stagflation’ of the early 1970s. There was the first international oil crisis in 1973, inflation was 13% in 1974 and by mid 1974 Australia was in recession. The political fallout from that saw successive governments at the national level – Whitlam/Labor, Fraser/Liberal then Hawke and Keating/Labor – scrambling to alter Australia’s economic foundations. There was a lot of Union unrest, job losses across the board but particularly in the public service and manufacturing. Unemployment was high and youth unemployment was higher – in the vicinity of 25%. In 1977 I only had a few credit points to complete to finish my undergrad degree and I spent a lot of time doing voluntary work at the Student Union Activities Department. Throughout the 80s I was surviving on unemployment benefits between part time and irregular employment as were many people. If I had wanted to continue doing architecture I would have had to find work in an architect’s office for a few years before going back to complete the last half of the degree. It wasn’t a good time to find that sort of work and I had decided to follow my interests in the arts. Working at Activities gave me something to do and access to facilities. 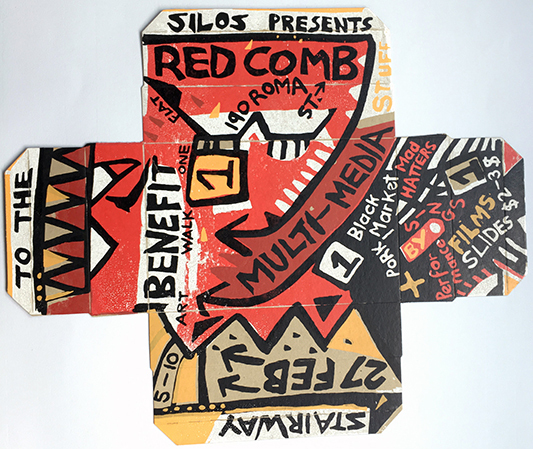 I did a huge amount of screen printing because one of my jobs was helping students – and anyone else who turned up – to print their posters and t-shirts. The people who turned up were from all over Brisbane and involved in just about everything you could imagine because Activities was open access (another one of those concepts that has disappeared). But it wasn’t just screen printing facilities. 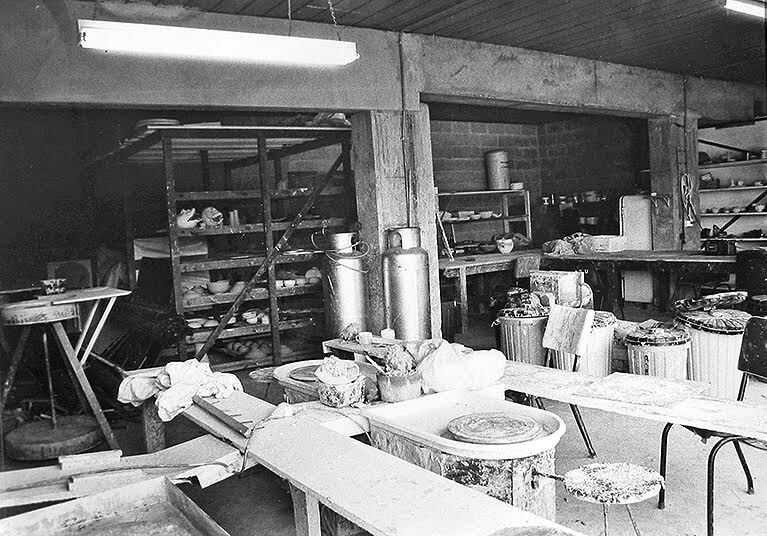 I had created photographic darkroom facilities and a ceramics workshop with a large gas-fired kiln. There were general workshop spaces for drawing and painting and anything else that needed a space. The workshops and campus entertainment that we organised provided some income to artists, musicians and entertainers. Over time an arts/media hub started to form – not unlike the ‘magic mile of motors’ at Moorooka (where I grew up). After Activities had a cement floor put in under the refectory extensions and enclosed a space, an office for the student newspaper, Semper, was built alongside it – this attracted another group of graphic astists, designers, writers, and also provided a graphic arts camera that made photographic screen printing possible at the Activites workshop. 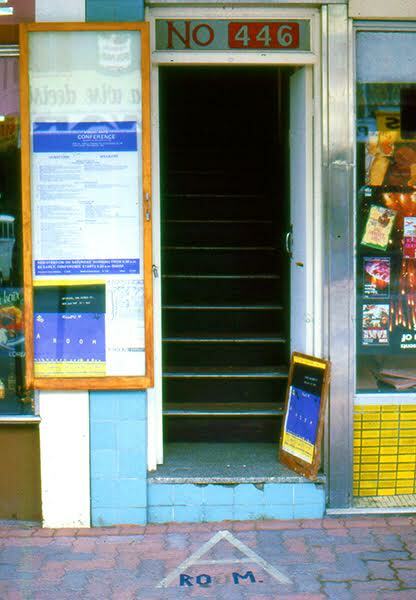 The student radio station 4zz (which became 4zzz) had also been set up just down the stairs and the Schonell cinema/theatre and Cement Box theatre were just a stone’s throw away. Just like many art enclaves around the world this was not really planned. It happened because the arts occupied unwanted, abandoned, disused and marginal spaces for financial reasons (look at downtown Manhattan and the Lower East Side in the same period). 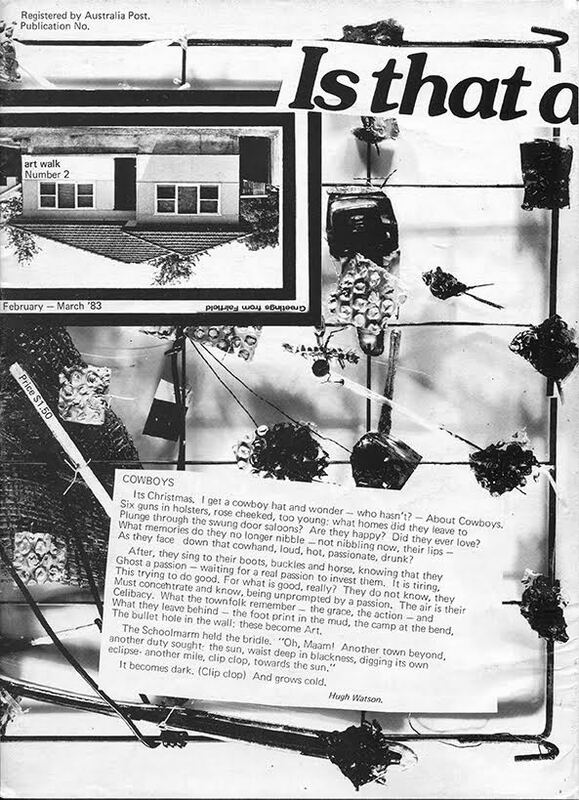 The Campus based arts/media hub was a fabulous melting pot of people and ideas from theatre, music, political groups of all persuasions, visual art, craft, and even some normal people. Many creative people found their way to the facilities available there and they also met and were able to collaborate with like minded people. I was fortunate to meet and work with many of them. For me, Activities and that larger hub was an important location that started to develop a publicly accessible arts scene in Brisbane. I would also like to acknowledge the role of the Student Union in fostering and supporting these larger cultural developments. A lot more people became involved with the art scene when vacant buildings in the CBD started to be used for studio and exhibition spaces. Being located in a ‘centre’ and occupying these more public places created a new dynamic and a frisson of simply being visible. Being able to be seen in public felt like a great breakthrough. Brian thanks, yes there is much ado about The Bjelke-Petersen regime in the collective memory, “The Police State” years, a unique 1980s backdrop in Australian political history, twenty years of “oppression” how did it directly or indirectly impact upon you or not ? This question is also a part of the living-working-collaborating story because politics and left politics in particular was a part of the everyday then in a way that it’s not now. Partly that was influenced by the financial and political upheaval mentioned earlier and partly by the ongoing postwar politics that broadly pitted capitalism against socialism. Art was bound up in political discussions as either elitist capitalist rubbish or revolutionary social challenge. Personally I was interested in art as a challenge to the conservative and repressive environment of Brisbane. I mixed with and did work for many groups – socialist, communist, international socialist, unions, libertarians, anarchists, feminists, bikies, punks, gays, even the labour party – but I was not a card carrying member of any of these groups. Capitalism did seem to me to be a fundamentally exploitative system and I supported the idea that people should at least be able to hold and express a range of alternative positions. The Queensland Government headed by Bjelke Peterson on the other hand thought that three people walking side by side on the footpath was a threat to the State and made it a crime. The song ‘Pig City’ by the Parameters became a Brisbane anthem because it expressed an everyday reality. The repressive conservative political environment and politicised policing led to solidarity and a feeling of shared purpose between groups. This impacted the developing art scene in Brisbane in a number of ways. There was an anarchistic visual style that related to punk and DaDa that probably had a greater general appeal than elsewhere in Australia. There was also a very broad movement of activism and many artistic and cultural artefacts had an ephemeral nature. Urszula Szulakowska’s ‘Bris DADA’ article in Eyeline number one, 1987, is a good account of these influences. 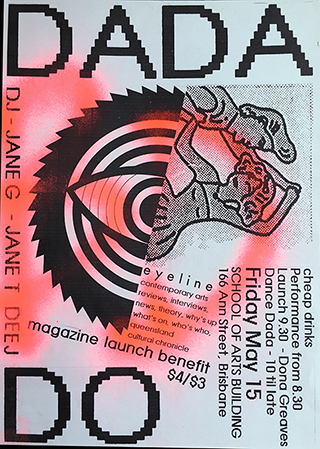 It’s worth noteing that the launch of Eyeline magazine was titled DADA DO. It is a title that confirms the recognition of a DADA lineage and also the humour inherent in that position. DADA DO was as much a reference to the ‘Flintstones’ theme song as it was to the historical art movement and the Flintstone quarry was Brisbane itself with holes full of (Barnie) Rubble. 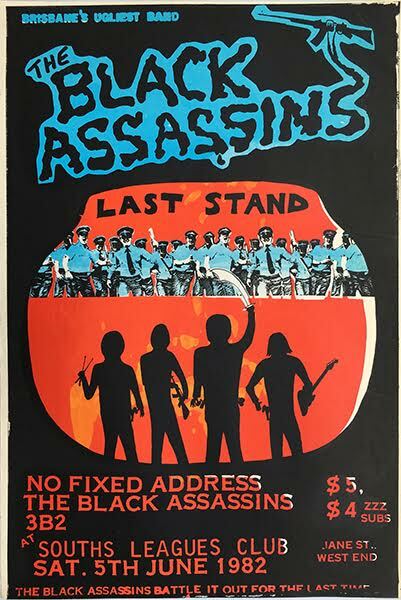 The Black Assassins, Last Stand, Poster, 1982. Collection of Brian Doherty. 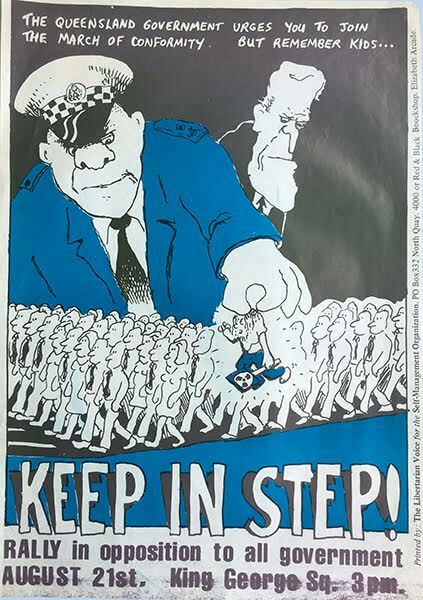 Right to March Poster, Keep In Step!, 1979, drawn by Matt Mawson. Collection of Brian Doherty. Collection of Brian Doherty and Jane Richens. 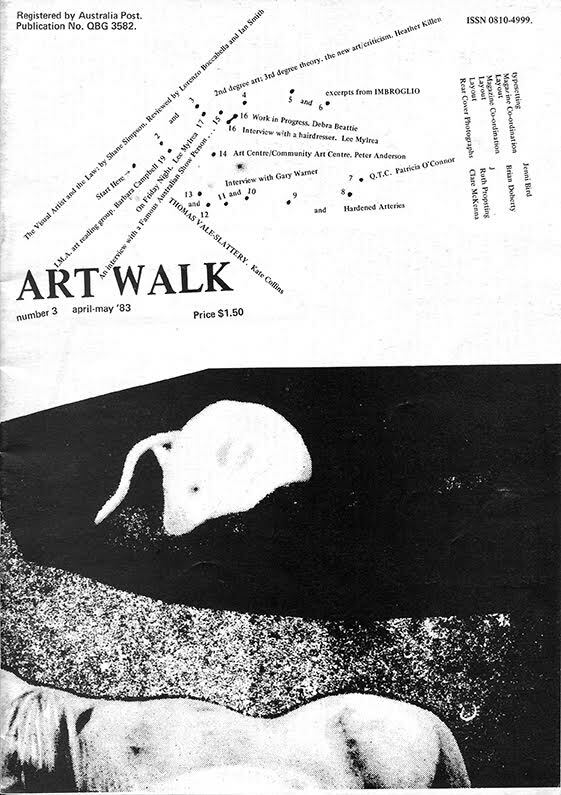 Art Walk Benefit poster designed and printed by Hollie, 1983. Collection of Brian Doherty and Jane Richens. Another influence of the ‘shared enemy’ mentality was the diversity that characterised and set the Brisbane art scene apart from those I had contact with in Sydney and Melbourne. Many different groups found a place for themselves within the Brisbane art scene. There was a great deal of cross pollination going on – between music, theatre, performance, visual art, film, photography, crafts, political groups, high art and low art – they were all in together. Partly it was a factor of size – Brisbane being large enough to have developed a diversity of social groups but small enough that those groups could not develop in isolation – but importantly there was the added glue of a common enemy. Queensland Artworker’s Union, May Day March, Monday March 6, 1985 (Photo: Brian Doherty, Pictured l-r, Racheal Bruhn (in background), Darryl Graham, Eugene Carchesio (background), John Waller, Unknown (background), Peter Anderson (obscured by hat), Hollie, Adam Boyd (obscured by hat), Shane Kneipp, Erin Flannery, Russell Lake, Phyllis Paterson (spotted pants), Cynthia Irvine, others unidentified. Later when I moved to Sydney I experienced a much more ‘stand alone’ visual art community. To me it was less challenging – at least in regard to its own diversity – and had less connection to, or meaning within, its place of production. Relation to place is the last ‘influence’ I would like to bring into this discussion although it is only obliquely concerned with the ‘Police State’. 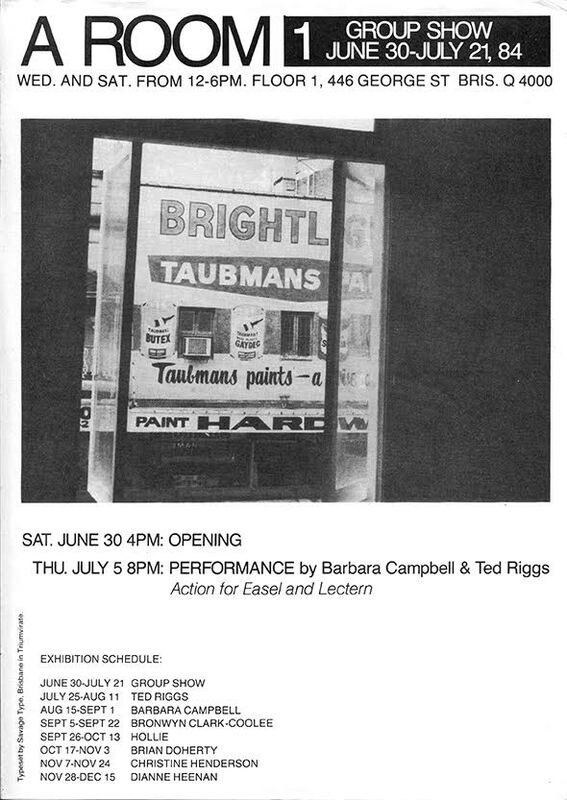 To me, Brisbane’s provincial status relative to both the Australian and International art ‘centres’ – was just as repressive and ‘real’ as the Bjelke Petersen regime. Most artists were acutely aware that, as a general rule, “What happens in Brisbane stays in Brisbane”. And the corollary of that was an institutionally supported cargo cult of imported cultural products. If for whatever reason you chose to stay in Brisbane you had to adjust your art practice to that reality. 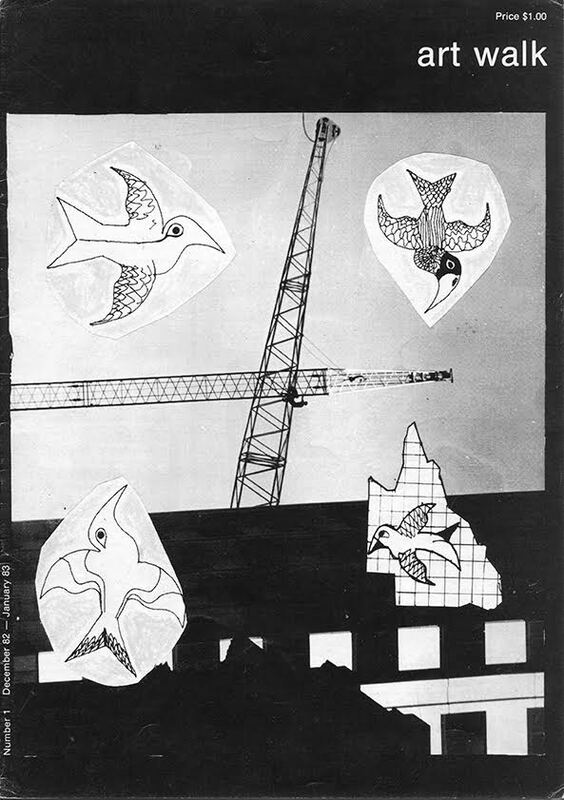 I think Brisbane’s artists banded together and supported each other and made art that was relevant to themselves, and the place they lived in, as much because of the repression of the art industry as the practices of the police or the fascist tendencies of the government. The repression of the art industry operated on many levels in both overt and covert practices and discourses. Identifying these discourses and practices and finding ways to penetrate and change them was an ongoing discussion and the ‘practice’ of the art scene itself. Ultimately, I think, the degree of passion and unpaid labour that went into the establishment and running of artist spaces, the establishment of the Artworkers Union, a locally based art magazine and the ongoing strategic engagements with the institutional outposts of the international art industry can only be explained by reference to that repression – the lack of access to a meaningful discourse with a larger art industry. Many people left Brisbane to follow an art career elsewhere – usually within an art ‘centre’ – and that decision was more likely to be the result of addressing art industry politics than addressing Queensland State politics. So overall while I agree that the reality of the ‘Police State’ and all that it meant was a substantial and important influence on the nature of art practice in Brisbane in the 1980s it does not explain everything. In the historical narratives that I have seen in the last few years, I think that Bjelke Petersen has been given much more credited for determining the cultural productions of the 1980s than he deserves. For me ‘Bjelke Petersen’ is too large in the media imagination and too easy as an explanation. There were other important influences that need to be explored, and if they are, then a more balanced, and more diverse, picture will be revealed. And that picture will have greater relevance today because many of the issues will be seen to have continued beyond the fall of the Bjelke Petersen government and it will also reveal a lot of similarities to art scenes in other places around the world both then and now. And Brian, what types of art making were you up to during the 1980s? I employed painting, drawing, film and photography but printing ended up at the top of my list because of simple repetition (pun not intended). I did a lot of it and a silk screen became like a pencil or a paint brush to me. In my art practice I was not particularly interested in the commercial properties of printing – reproduction and the associated editioning. I was more interested in the narrative possibilities of repetition with variation. This was a unique opportunity offered by a screen as opposed to a paint brush but at the time it was an unusual approach to printing. 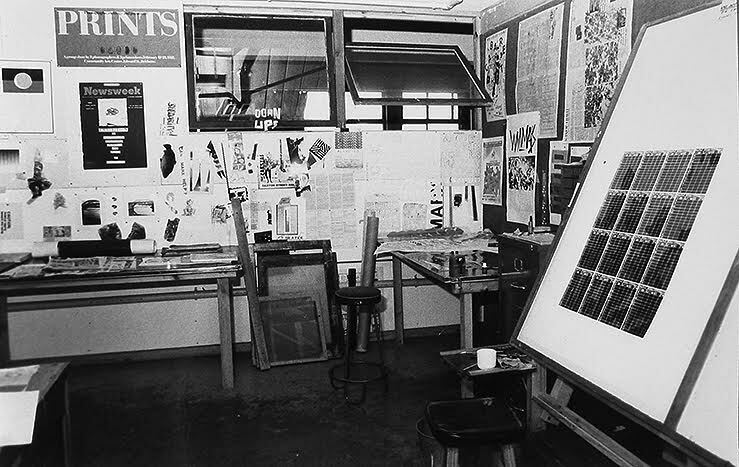 The Print Council of Australia was trying to establish the legitimacy of print making as an artform and its discourse was dominated by concerns about uniform editioning and the importance of ‘the hand of the artist’. My own printmaking often started with an existing printed work in the public domain – a newspaper, a piece of ‘junk mail’, a printed box etc. And I used overprinting with variations, generally over 3 or more pages, to bring to life some aspect of the structure or social meaning of the existing design. The graphic conventions and practices that could be ‘read’ by most people without necessarily being consciously aware of them became the subject matter of my art. Malcolm Enright’s ‘Inseparables’ series had some similarities, but his intervention was the title of the work. While this explanation may sound academic it was often a light hearted exercise. In general my art changed its focus over the period toward engaging the discourses and practices of the art industry itself. I would see an artist like Marysia Lewandowska having a similar focus in the contemporary artworld. 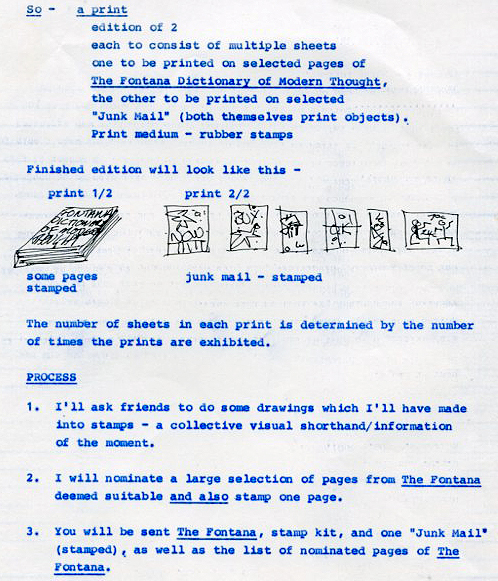 Extract of print proposal (1984) for Print Council of Australia Print As Object touring exhibition (1985-1987). Kinship Brian, a brief biography about your family’s recent or not so recent immigration story? On my mothers side the family history in Australia goes back to 1873 when a group of Lutheran Prussian farm labourers arrived in Brisbane aboard the ‘Lammershagen’ which had sailed from Hamburg. They settled in the Fassifern Valley south west of Brisbane. My mother grew up in that region along with 10 other siblings. I know less about my father’s family background but he also came from what would be considered today a large family of nine children. He grew up in the Brisbane suburb of Milton and can remember collecting milk from a farm where the Queensland University is today. Place names like Boonah, Harrisville, Kalbar, Roadvale were very familiar to me as a child because I would stay at farms owned by my mother’s brothers and sisters during school holidays. It let me experience a very different lifestyle than my life in the western Brisbane suburb of Moorooka. I am sure that is one reason why I have chosen to live in a small rural community. So many diverse collaborations, why do you feel artist-run culture proliferated so well, such a fecund time Brian? Regarding why the art scene proliferated I think I have covered that already. So much collaborating happened – yes it did! Ten years of collaborating on a daily basis it is difficult to nominate two or three instances. For me Malcolm Enright stands out as an important collaborator with many people and across the whole period and beyond. He is an artist run space all by himself. I’m sure many people would have stories of the importance of his critical perspective and support. He was always there doing his own thing and helping other people do there own thing. He was and still is an amazing catalyst. 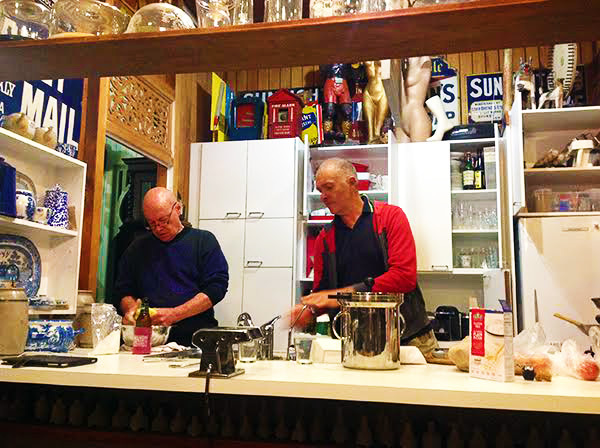 l-r Malcolm Enright and Paul Andrew in Malcolm’s kitchen, 2015, Still collaborating! Photo: Brian Doherty. I first met Malcolm when we were both on the board of the Institute of Modern Art and the first project we worked on together, along with Barbara Campbell and Ted Riggs, was a large single sheet full year calendar for the IMA membership. It included important dates of Modern Art history and original newspaper reviews of important exhibitions like the exhibition of degenerate art held in Germany in 1937 and the 1913 Armory show in America. I had suggested the concept to Barbara. She found the newspaper reviews in the State Library and Malcolm did the design and layout and used his printing contacts to get it produced. My collaborations continued with Malcolm in many and varied ways. He was critical for the inception and development of Eyeline magazine, the design and production of the early issues and the physical process of laying out and paste up took over his house for a week at a time each issue. And as with most of the arts work being done there was no payment. Barbara Campbell and Ted Riggs were the brains behind many of the important initiatives while they were still in Brisbane. The idea of doing guest curated shows at the IMA as a way of getting through a funding crisis came from them and that opened up the range of work that was shown there. A Room was another important exhibition and promotion model that they thought up. The ‘practice’ and ‘practices’ of A Room were all worked out in advance by Barbara and Ted. This was a great lesson for me in the type of meta-art that could use the structures of art practice as its subject. Their collaboration was also part of the bedrock for setting up the Queensland Artworkers Union and they were elected as co-chairpersons at the formation meeting on 29 November 1983. Other people elected at that meeting were Ruth Propsting (Treasurer), Clare Williamson (Secretary), Steering committee – Bronwyn Clark-Coolee, Lyndall Milani, Adam Boyd, Luke Roberts, Russell Lake; Constitution working Committee – Bronwyn Clark-Coolee, Russell Lake, Michelle Andringa; Fundraising Sub-committee – Robyn McDonald, Zeliko Maric; Publicity Sub-committee – John Waller, Christine Henderson. I am sure you would find all of those names cropping up in various permutations associated with activities throughout the art scene. Less than a year later on 12 September 1984 I chaired a meeting of the Artworkers Union where Barbara outlined a proposal to hold a major visual arts conference. Five days later on September 17 there was another meeting where the details of the conference were finalised – where it would be held, the speakers: representing the Visual Arts Board of the Australia Council; local educational institutions: Qld College of Art, Brisbane College of Advanced Education, Qld University Fine Arts Dept, Darling Downs Institute of Advanced Education, Brisbane Institute of Fine Arts; State Government funding bodies and the Labor Party shadow minister for the Arts; Galleries: Qld Art Gallery, Uni of Qld Art Museum, Griffith Uni Art Collection, Institute of Modern Art, Qld Regional Galleries, Aust Commercial Galleries Assn, Qld College of Art Gallery, Civic Art Museum, and the dates – the weekend of October 27/28 – which was less than six weeks away. The people attending those meetings were: Hollie, Russell Lake, Phillip Dean, Barbara Campbell, Ted Riggs, Urszula Szulakowska, John Waller, Ruth Propsting, Barbara Allen, Michel Sourgnes, Di Heenan, Wendy Mills and myself. The amazing thing is that in less than 6 weeks that conference ‘Everything You Ever Wanted To Know About the Visual Arts… But couldn’t Find Out’ was organised, advertised and held at the Centre Cinema, Brisbane Community Arts Centre, 109 Edward Street Brisbane. Collaboration proceeded at a hectic pace in those years and for many of the people involved it would have been full time voluntary work. Anything you would like to add Brian? This ARI Remix project collaboration has provided the opportunity to open up boxes that have been closed for the past 30 years. Personally it has been fascinating and rewarding to work with the material and to reconnect with people. It was a rich and important time for the cultural development of Brisbane.